If you’ve been following this blog since 2014, you’ll probably think that I’ve already reviewed this movie. You would be right. When I originally reviewed The Aviator, I was under too much stress from preparing a big move, so I spent a little too much time playing Skyrim. I’d watched the film to take a break from the game (which I was playing to take a break from packing), and ended up deciding to write the review. Unfortunately, I was too eager to get back to the game that I rushed the review and it was one of my worst ones ever. Second only to my Lion King review. I’ve been wanting to rewrite this for a long time, and now I’m finally doing it. Here is my original “review”, if you want to read it to see what I mean. I didn’t delete it, I just took it off the list and changed the category from Casabloga to Uncategorised. Anyway, this is in my opinion one of Leo‘s best films. I didn’t know much about Howard Hughes when I first watched it in 2004, but it’s what got me interested in him. After watching it, I read and watched everything I could find one him. The movie took a few liberties, but it’s accurate enough that I like to point to it as an example of how to make a biopic. Everyone knows that he went mad later in life, but the film does a great job at showing him slowly getting there, even in his younger years. He had one of the most severe cases of OCD that I’ve ever heard of. In fact, when I was diagnosed with OCD when I was 22, I told them that I wasn’t anything like Howard Hughes. The doctor laughed and explained that there are different levels of severity. Watching the film from the perspective of someone with OCD, I can totally relate to most of the things he does. Most of them are things that just bother me but don’t go as far as to tell anyone about, where he would have entire teams of people make sure everything was exactly the way he wanted. I sometimes wish I could do that, but also realise that’s not exactly a healthy way to live. I think one of the biggest examples is actually something he does in the movie that makes him seem like a real jerk to most people. There’s a scene where he’s washing his hands and a guy with crutches is washing his hands next to him and asks him to hand him a towel. He says, “I’m afraid I can’t do that”, making the guy with crutches get it himself. Yes, that seems like a jerk move, but I honestly felt like I understood. Maybe this isn’t why he did it, but in my mind I couldn’t imagine touching the clean towel while my hands still had soap on them. I’d have to wash the soap off first, but then I’d be handing the guy a wet towel. I mean, if that scenario personally happened to me I would just hand him the towel, but I’d have to start over and rewash my hands all over again. There’s something that happens late in the film that is an extreme version of something I’ve been through. His girlfriend comes over and he has sections of the house roped off, saying “This is the germ-free area. You’re safe here”, then freaks out when she goes into a taped off room. I’ve never roped off areas, but I have avoided using entire counters because I set a dirty pan on it a week ago, and I know that spot is dirty (for example). But the fact that I can watch this movie and relate to the OCD tendencies is testament to how good of an actor Leo is. I literally believe that this is Howard Hughes, and he is afraid of germs. Another amazing actor in this film is Cate Blanchett as Katharine Hepburn. Cate is spot-on as Katharine. Here is the first time we see her in the film, and here‘s a compilation of clips of the real Katharine shown at the 2004 Academy Awards to honor her life (she passed away in 2003). The first two minutes is Julia Roberts talking about how awesome she was, because she really was a legend. But those are just two of the stars in this film. You’ve got Alec Baldwin, John C. Reilly, Alan Alda, Kate Beckinsale, Ian Holm, Jude Law, Gwen Stefani, William Defoe, and a much more. I have to mention the fact that they got the extraordinarily talented Rufus Wainwright to sing Stairway To Paradise. This film is what introduced me to him, and he’s ridiculously talented. He can do pretty much anything. Some of my favourite of his songs include Hallelujah, Cigarettes & Chocolate Milk, and Across The Universe, which is one of the rare good Beatles covers (and yes, that’s a young Dakota Fanning). I think my only real complaint with this film is that it stops when it does. He flies the Hercules (Hughes hated it being called “Spruce Goose”, so I never call it that), then the movie ends. But he lives thirty more years before dying. I kept waiting for there to be a sequel showing the rest of his life, but by now I doubt they’re going to. It’s been fourteen years, they’d have done it already. Unless they’re waiting for Leo to get to the right age, which makes sense. Also, I think another reason they stopped when they did is because around that time is when the madness really started to kick in. He spent so long in seclusion, doing business deals behind closed doors, that the public started to wonder if he’d actually died and people were just benefitting off his name. It got to the point where he ended up being forced out of seclusion to prove he was alive. If you want to know more information on Howard Hughes, I highly recommend this documentary. It goes more in-depth, and actually contains interviews with several people who knew him. You can also read this book for even more information. The author is interviewed in the documentary. If you’d have told me a week ago that I’d be writing this post, I’d have called you crazy. Heck, if you’d told me yesterday. When I first heard of Unfriended, I assumed it was just a gimmick. There’s no way a movie that’s just a Skype call could possibly be good. The fact that there’s already a sequel just proves it. But one of my bestfriends saw Unfriended: Dark Web today and posted on Facebook, “I am legit walking out of the theater shaking. “These Unfriended movies are dementedly genius!” (that was his post copied and pasted). I was confused, so I commented saying that I’ve never seen the first one. He and another friend commented that I should. We usually agree when it comes to movies, so I rented it on YouTube and watched it tonight. So, as you can see, in less than half an hour I went from thinking it was just a gimmick to actually liking it. Almost immediately, I realised it was something unique. It uses real sites and programs, such as Facebook, Spotify, and Skype. This was a surprise to me, because usually in movies they use fake ones. Using real things adds to be authenticity and believability of the film. The entire film is from the screen of the main character, Blaire. It opens with her looking up information on her friend, Laura Barns, who committed suicide a year previously. After a minute her boyfriend calls and the story begins. It’s essentially all in one shot, because it never cuts away from the screen, and instead has Blair switching tabs on the left (she’s using a Mac). But as boring as this probably sounds, this is actually used to great effect to tell the story. You can see by the way the cursor moves how Blair is reacting to situations. Something will pop up and the cursor will pause, then slowly go over to click it. I think one of the best uses of this is one scene when the characters in the Skype call criticize Laura, the girl who committed suicide, and Blair is using iMessage with her boyfriend in another tab, telling him they didn’t know Laura like she did, that she had a hard life. When her boyfriend asked what she meant, she types, “When she and I were young”, deletes it, types, “When she was”, deletes it, types “Her uncle”, deletes it, then finally types, “Just family stuff” and sent it. So much is implied by her deleted messages but isn’t explained. We don’t need it explained, and a lesser film would have gone down that road and handled it poorly. The acting was surprisingly realistic. The group of friends got into a few fights, and there were real tears shed. Then when they were laughing and joking around, it felt like they were actual friends in a Skype call. I believed that we were watching a real group of friends interacting. Even when they were fighting, if something happened between one of them they suddenly stopped fighting and showed genuine concern. I was legitimately freaked out several times watching this movie. It’s very rare for a modern horror film to scare me, and I think the last one to do so was It Follows. Pretty much my only real complaint with the film is the very last second. Literally the very last second. they go the jump scare route. But unlike Paranormal Activity’s jump scare ending, it actually makes sense. I just generally don’t like jump scares. But as I said, that’s my only complaint, and it doesn’t ruin the rest of the film. It’s not like it turns out they were actually on an alien spaceship the whole time or something. I’m now excited about seeing Dark Web. According to my friend, and most of the reviews I’ve seen before writing this one, it’s better than the first. I seriously hope so, because this one was amazing! Everyone suggested that I watch this movie because I’ve been obsessed with pop culture my whole life. But I honestly had no interest watching it. To me, it felt like they were just trying to cash grab the whole nostalgia trend. I just watched it, and I have to say… Of course they did! They’d be dumb not to! Instead of just throwing every single nostalgic pop culture they could afford into an incoherent non-story like I was fearing, it was honestly one of the most coherent and interesting stories I’ve seen in awhile. To me, it felt like a cross between The LEGO Movie, Assassin’s Creed (the games, I have yet to see the movie, but I’m sure it’s the same concept), Infinity War (at least during the epic battle near the end, and how it ends), and finally Willy Wonka and the Chocolate Factory (especially how the movie ends). I don’t know if that was the intention, but that’s the vibes I got from the film. Believe me, those aren’t bad comparisons, and I totally mean that in the best way possible. Especially the Assassin’s Creed element. It takes place in the present, and you use the Animus to go to a realistic game world, and you’re on the run from Abstergo, and even corporation. In Ready Player One, Wade puts on a headset to go to a game world, and is eventually on the run from IOI, and evil corporation. In The LEGO Movie, the main character meets a tough girl with purple hair, and the two of them end up teaming up to take down the corporation. In RP1, the main character meets a tough girl with purple hair, and the two of them end up teaming up to take down the corporation. Again, not saying this to put the movie down. Even something as original as Inception has the same plot as a Donald Duck comic strip. Everything is inspired by something else. That’s not a complaint, just an honest inevitability. I highly recommend everyone watch this film. Considering I didn’t think I’d like it, I ended up getting excited at several moment, and literally cheering when certain characters appeared. I only have two complaints. The Iron Giant has a war mode that they never used. During the battle at the end I was expecting him to change, but he never did. The other thing is the Holy Hand Grenade. It’s from one of the funniest moments of Monty Python and the Holy Grail. In the scene, they made a big deal about having to count to three before throwing. Wade pulls the pins, then throws it. If they’re going to include a reference like the Holy Hand Grenade, they should get it right! But honestly, that’s just a nitpick. The movie as a whole was amazing. When I heard that they were making this film, I knew immediately that I had to see it. I’ve been a fan of Van Gogh my entire life, and in fact The Starry Night is my favourite painting of all time. But the moment I officially became obsessed with him was when I watched Vincent and the Doctor, in my opinion the greatest Doctor Who episode of all time. Loving Vincent is not only the story of the life of Vincent Van Gogh, but also the circumstances surrounding his death. Officially, he committed suicide. However, there have always been rumours that he was shot by someone else and just told everyone he shot himself so no one else took the blame. Not only is the story fascinating, the visuals are unlike anything you’ve ever seen before. To be honest, this is the perfect way to tell his story. All of his paintings come alive, because everything he painted was inspired by actual people and places. In fact, Armand Roulin is the main character. 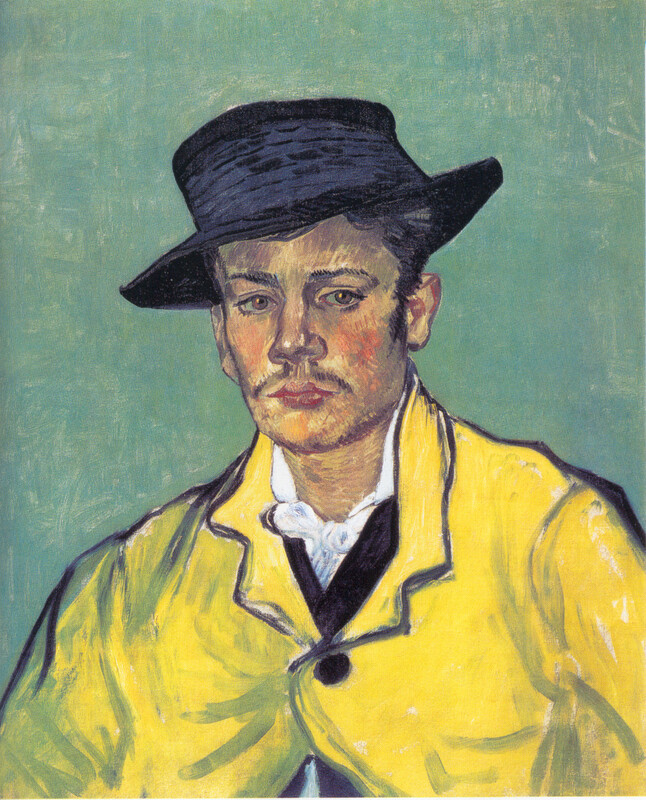 Armand was the subject of some of Van Gogh’s paintings. His whole family was. I feel that Vincent’s story is a very important one to share, because it’s a very relatable story of mental illness, depression, and suicide. He may, in fact, be the most relatable historical figure. That Doctor Who episode really helps to make him feel like a modern figure. As though if he were alive today he’d have had a better life. Not that he wouldn’t still be depressed, just that there’s now treatment for it. Back when he lived, he was just considered “mad” and everyone picked on him. Which, naturally, didn’t help his depression. At the beginning of this post I linked to a scene from the Doctor Who episode “Vincent and the Doctor”. The following contains spoilers for that episode. For context, Amy Pond (the Doctor’s companion at the time) wanted to save Vincent from killing himself. She feels that if he knows how important he is in the present time, he wouldn’t kill himself. Van Gogh never knew he was famous, because that didn’t happen until after his death. So the Doctor uses the TARDIS to bring him to the present (when the video begins) to show him that all of his artwork is on display where all of the greatest works of art is, given it’s own special room. It’s the most crowded room in the museum. The Doctor has the curator (played by Bill Nighy in an uncredited role) talk about how important Vincent was to history, which obviously brings him to tears of joy. The beauty of the episode, and the reason I feel it’s one of the greatest episodes of the show, is that despite their efforts, Vincent still kills himself. Amy is confused, and the Doctor stresses that they can’t undo all the bad in the world. Basically, depression isn’t as simple as “Oh, I’m happy now, I’m all better”. Vincent was penniless and (at the time) hated by almost everyone who knew him. You’d think that’s why he committed suicide. So why did Robin Williams do it? He’s the complete opposite. extremely successful and loved by all. He had four films released after his death. Vincent’s suicide makes sense from a logical point of view, so why did Robin Williams do it? The answer is that depression isn’t logical. Everything could be going right in your life, and yet you still have this dark cloud over you that you just can’t explain or understand. You could be surrounded by everyone and yet feel like you are alone on a deserted island. This is why I feel it is important for this story to be told. Loving Vincent is available on Blu-Ray as of today. If You Know Someone in Crisis. Call the toll-free National Suicide Prevention Lifeline (NSPL) at 1-800-273-8255, 24 hours a day, 7 days a week. The service is available to everyone. The deaf and hard of hearing can contact the Lifeline via TTY at 1-800-799-4889.